This Chocolate Banana Chia Seed Pudding recipe is perfectly sweet from the bananas, deliciously chocolatey from the cocoa, and surprisingly filling thanks to the chia seeds! This makes for a great breakfast because it’s full of healthy ingredients such as chia seeds (high in omega-3 fatty acids) and bananas (high in potassium), and it also happens to be refined sugar free, high fiber, gluten free, and vegan too! Seriously, this is HEAVEN. I made it a few days ago and ended up having a bowl for breakfast every day since. It’s just so chocolatey and banana-y and delicious, it’s hard to put the spoon down. Oh, and with a few extra banana slices on top and mini chocolate chips? You’ve got yourself a winner. Winner, winner, chicken dinner chocolate-banana breakfast. For a “chunky monkey” variation, feel free to scoop some creamy peanut butter on top so you get some PB with every bite. 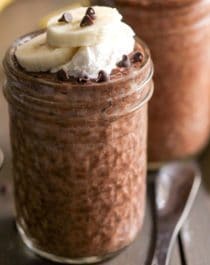 This Chocolate Banana Chia Seed Pudding is perfectly sweet, deliciously chocolatey, and surprisingly filling! It's sugar free, gluten free, and vegan too! In a large bowl, mash the bananas. Whisk in the cocoa powder. To the bowl, add the almond milk, vanilla extract, chia seeds, sweetener, and salt. Whisk thoroughly until even, the cover and refrigerate overnight. Chocolate pudding is among my favorite desserts. While chia is an excellent source of omega-3 fatty acids, strawberries are among the fruits that have a low level of sugar. I listen to a podcast to get a wider understanding about nutrition and well-being. Chia seeds are just amazing. They pair so well with chocolate and just soak up all the flavors!